Will Touchscreens Kill the Keyboard? We have more ways of interacting with our devices than ever before: voice, gestures, eye-tracking, as well as simply tapping on keys. 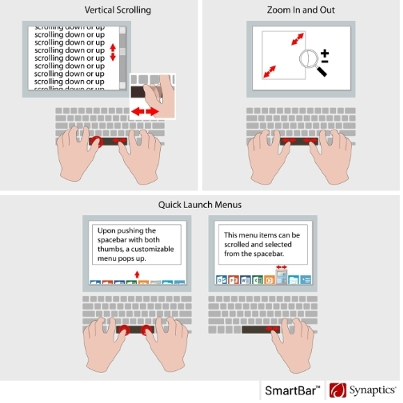 Synaptics thinks we need another method: swiping on our spacebar. On Wednesday, Synaptics announced that its SmartBar technology would be available in keyboards from Tt eSPORTS, the gaming accessory division of Thermaltake, and others. Given that Synaptics invented the touchpad, it’s not surprising that the company would put a touchpad in the spacebar; in fact, they want to put one in every key on your keyboard. “Synaptics has been expanding its offering within the PC industry and has seen significant traction among OEMs and ODMs for our innovative SmartBar technology,” said Huibert Verhoeven, senior vice president and general manager of the Human Interface Systems Division at Synaptics. Synaptics may have made its fortune on laptops, but it's eager to push into desktops, too. “Integrating our touch and biometrics technology into the desktop market is a natural extension of our solutions, and just the next step in our mission to further advance the human interface revolution,” Verhoeven added. SmartBar works by treating the spacebar as a secondary touch pad—not as a replacement for the larger, primary one a few millimeters below. You can reproduce some of the same gestures—pinching to zoom a window, or scrolling up and down on a Web page, for instance. Other gestures are more unique, such as a quick way to zoom back and forth between open windows or menu items, or shift between macro functions. But it just looks so odd. Perhaps that’s the reason why obscure players like ThermalTake are implementing the technology, rather than larger customers. Synaptics also said its Natural ID biometric solution for desktop PC mice—which puts a fingerprint sensor in your mouse—was being shown off in mice from LiteON, Thermaltake, SolidYear and EVGA at Computex. While that still seems a bit unnecessary, it also eliminates the need to design a fingerprint reader into your laptop. That’s helpful for users who want to install Windows 10’s Windows Hello—which can log you in via a fingerprint—on older machines. The story behind the story: Each of us has different ways of working—some prefer keyboards, some work best on mobile. There are those who automate their lives through dozens of keyboard macros, while others hunt and peck. It’s foolish to rule out a piece of technology because it doesn’t meet your particular lifestyle. That said, I have serious doubts about SmartBar's prospects. For one thing, some users might tend to let their thumbs drift over the space bar. A more likely scenario would be an accidental tap of the space bar as the user tried to trigger the gestures, moving the window or the cursor inadvertently. We can see what Synaptics is trying to accomplish here, but this seems like a solution in search of a problem.